Creating simple, time offset based animations has never been easier! Create a simple animation on a single layer. Create as many child layers as you want WITHOUT adding any animation. Create an optional background layer. 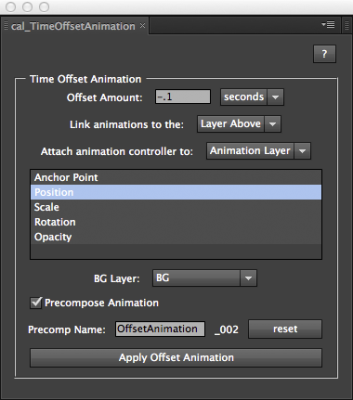 Apply the Time Offset Animation tool. Check out the original tutorial that inspired this tool for a more in-depth explanation of setting up your compositions. If you'd like to learn more about scripting and some of the programming that went into this tool, check out this tutorial. It also contains a link to the source code in case you are interested in checking out under the hood.